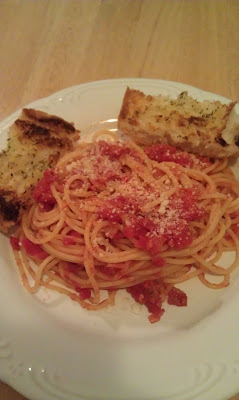 Chris and I love Cacio e Pepe so when I saw the recipe for Bucatini all'Amatriciana on The Italian Dish blog I had to make it. I used spaghetti in place of the bucatini. But I was able to find San Marzano tomatoes. Dinner was delicious. Where were we last night? We went to the Infinity Music Hall for dinner and to see Chielli Minucci and Special FX with Special Guest Bernie Williams. Yes that Bernie Williams from the Yankees. It was an amazing show. They opened with Little Wing and this was their last song.